The winter of 1960 was a historic one in North Carolina, not only because of the Greensboro Four, but the CIAA Four too. Fifty-eight years ago, four young men left the campus of North Carolina A&T and changed the world. David Richmond, Franklin McCain, Ezell Blair Jr. and Joseph McNeil are better known today around the world as “The Greensboro Four” (and the A&T Four on the quartet’s home campus) but before Feb. 1, 1960, they were just four students on an A&T campus in fierce contention for basketball glory. On the periphery of history, the quartet was surrounded by a Golden Age of HBCU basketball, as the CIAA was the premier basketball league for black college sports and A&T was one of its best programs. The Aggies, led by Cal Irvin, were in the middle of a season in which they hoped to win their third-straight CIAA tournament. They were led by Al Attles, a Newark, NJ native who could do it all. “There is nothing the New Jerseyite can’t do. He can shoot, run, defend and is a brilliant playmaker,” Perry Leazer of the Carolina Times wrote. The team’s biggest rival lay just half an hour down brand-new Interstate 40. Irvin’s Morgan State football teammate Clarence “Big House” Gaines was an institution in the CIAA by this point, with his Winston-Salem Teachers College Rams winning the highly-competitive league in 1954 and 1957. His team, led by the great Cleo Hill, another Newark star. 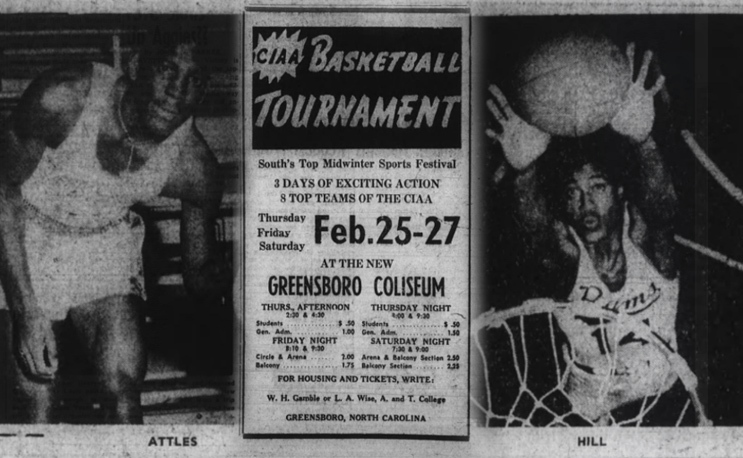 Hill wasn’t the all-around player Attles was, but he could score in his sleep and jump out of all the tiny gyms in the CIAA. Thanks to the familiarity between the coaches and stars, along with the close proximity of both campuses, the rivalry was perhaps at its height at this point. Case in point, when the two teams met on Jan. 16 in front of more than 4,000 fans in the old Winston-Salem Memorial Colesium. A&T won the game 71-68. According to Gaines, while Hill and Attles shook hands, an A&T fan hit Hill on the head. Hill took a swing at the fan, and a mob chased him back to the dressing room. Gaines claimed he was hit as well. Police were called to the Winston-Salem campus after reports that the angry spectators were headed there. So it wasn’t always peace-and-kumbaya. Ultimately the game was thrown out by the CIAA after incorrect calls by officials were determined to have altered the game. It was a tight race just to get into the CIAA Tournament. Only eight of the 18 teams in the conference, which included much of the present day MEAC (Morgan State, DSU, Hampton, etc.) at the time, made it to the tournament. The tournament was held in A&T’s backyard, at the brand new Greensboro War Memorial Auditorium and Coliseum after spending the previous years on the campus of North Carolina College (North Carolina Central). So with A&T being the two-time defending champion and playing at home, it’s no surprise that the pundits leaned towards the team from Greensboro, despite the fact that Johnson C. Smith took home its first-ever CIAA regular season title. JCSU claimed the regular season title with a 17-2 record, edging out A&T (15-4) and Winston-Salem (13-3). Winston-Salem’s 73-71 win over A&T in the regular season finale on a Tommy Monteiro layup gave Smith the title. The pundits, however, were not impressed. Meanwhile, the sit-ins not only continued, they spread. North Carolina College students staged one in Durham, while Johnson C. Smith alumnus Carl Matthews did the same in Winston-Salem. The tournament tipped off on Thursday, March 3. Virginia State ended Maryland State’s title hopes with a 70-69 win in the opener, while Winston-Salem held off Virginia Union 79-74. A&T saw its hopes of a third-straight title crash and burn on opening night, losing 87-72 to a Hampton team that had beaten it solidly just before The Four walked into Woolworth’s. The experts were right about Smith, however, as it fell 86-76 in the nightcap. The Friday crowd got to see two solid games as Winston-Salem put Hampton to bed 77-72, with Hill putting up 30 points against the Virginians. Keeping with that theme, St. Aug got the best of Virginia State with a 63-55 win. The two Virginia teams battled again early Saturday with Hampton coming out on top 73-59 over Virginia State to take home third place. The main event, of course, was the matchup of Winston-Salem against St. Augustine’s College. The star of the night would not be Hill, however. James Foree, a 6-6 sophomore put up 23 points as WSTC win the game easily with a 65-44 win despite just 10 points from Hill. Hill’s moodiness aside, however, Gaines was full of praise. Morgan State alumni Cal Irvin and Clarence “Big House” Gaines. The CIAA’s Big Four from that season would all go on to their places in history. Gaines would go on to win eight CIAA titles and over 700 games in a career that would last another three full decades and end in the Hall of Fame. Irvin would lead North Carolina A&T to three more titles in the 1960s before the program left to form the MEAC. The two men won all eight CIAA titles from 1957 to 1964 and another three combined before the conference split. As for their two star players, Attles and Hill, both would be remembered by history for different reasons. Attles would go on to a long career in the NBA with the Philadelphia Warriors, following the team to San Francisco and later leading the franchise to an NBA title as a coach in 1975. The now 81-year-old continues to be an ambassador for the franchise more than 60 years after it drafted him. Hill would be picked eighth overall by the St. Louis Hawks after his senior season in 1961. He was released from the franchise after just one season, blackballed by the league, never to play in the NBA again. His story went untold for decades until another Gaines disciple, Earl Monroe, told his story on the HBCU basketball documentary “Black Magic” in 2008. Hill died in August 2015 but was enshrined into the College Basketball Hall of Fame posthumously in 2017. Of course, the world remembers The Greensboro/A&T Four and rightfully so as their selfless act helped change the world as we know it forever. But The CIAA Four provided a necessary distraction for students, alumni and fans in the Jim Crow South. Even in The Carolina Times coverage of the sit-in, a basketball story about a freshman basketball player named Hugh Evans, yes that Hugh Evans, getting injured in a game at the Hampton Institute was just below it, right at the fold. Indeed, CIAA basketball was apparently a big relief for folks trying to wrap their heads around what was going on around them and where their place in the Civil Rights Movement was.